N. Orlando Accounting Services provides incredible service to all their clients with a dedication to professionalism, responsiveness, and quality. Their experienced staff makes sure that every client receives close, personal attention, as well as advice that is both fast and accurate. Accounting services are available individuals, small businesses, and large corporations. For individuals, N. Orlando Accounting provides estate planning, elder care, personal financial planning, and payroll services. For businesses payroll, accounting, audit reviews, strategic planning, litigation support, bank financing, and succession planning are but a few of the services available. N. Orlando Accounting also offers a full array of tax services and QuickBooks setup and training. 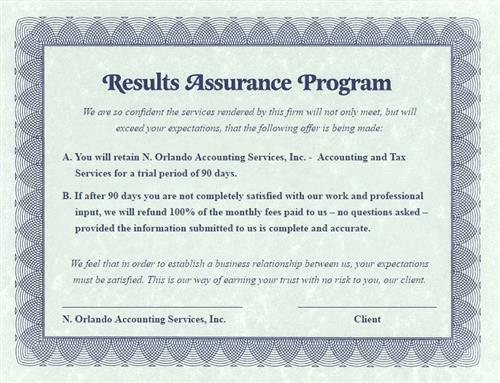 Do you have any experience using N. Orlando Accounting Services? If so, please rate your experience and let others hear about it using the form below.